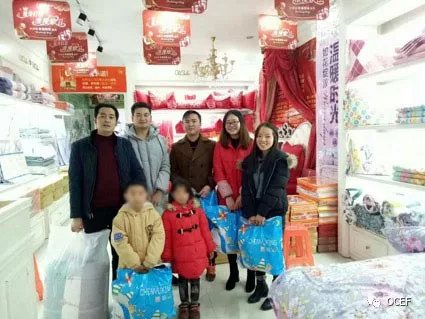 A new application for OCEF financial aid in December 2018 caught the volunteers’ eyes immediately. 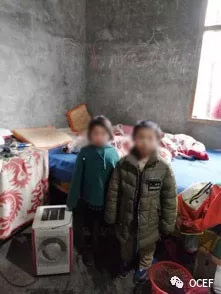 Two siblings from the Wang family, 9 and 5 years old, respectively, are currently enrolled in Sansheng-Dongpo Elementary School in Xanhan County, Dazhou City, Sichuan Province (their first names and images were modified for privacy reasons). They live with their grandparents as their parents have been completely out of their lives since they were very young. Their grandfather was injured in a traffic accident in the fall of 2015. He survived, but the accident destroyed his physical and mental health. Their grandmother had to leave home and earn meager wages in a different town. The family struggled even with helps from relatives, friends and neighbors. The Wang siblings had to wear ill-fitting clothes all year long and quiver during sleep as there was no warm bedding. Despite all the material scarcity, they maintain excellent grades at school and remain thirsty for knowledge. They have good manners and hope one day they will be able to make a decent living for themselves as well as for their grandparents. 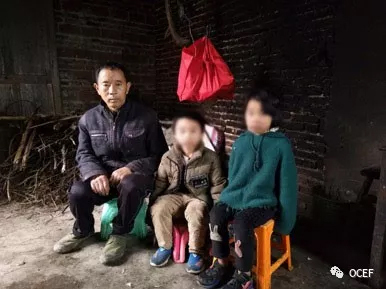 The hardships of the family caught the attention of the siblings’ teachers, who verified the situation and then, on December 9, 2018, applied for OCEF special project grant on the Wangs’ behalf. The pictures attached to the application broke the OCEF volunteers’ hearts. The application was approved and help came promptly. 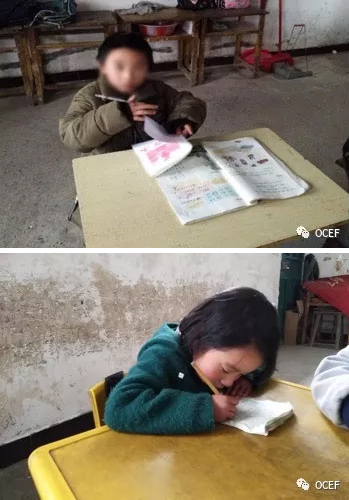 Children, everyone sees your effort. OCEF is right by your side through the moment of difficulty and wishes you a warmth-filled winter. Recently OCEF had completed its 1-to-1 students assistance program application review for the fall semester of the 2018-2019 school year. 435 elementary students ($100/student/year), 658 middle school students ($150/student/year) and 1018 high school students ($350/student/year) were approved for OCEF financial aid. The selection process is now open, although some students are temporarily held out for their previously paired donors from last school year. If you would like to earmark your donation this year for the 1-to-1 program, please log into the OCEF donation portal, make a donation and then enter the selection system to choose a students whom you would like to sponsor.